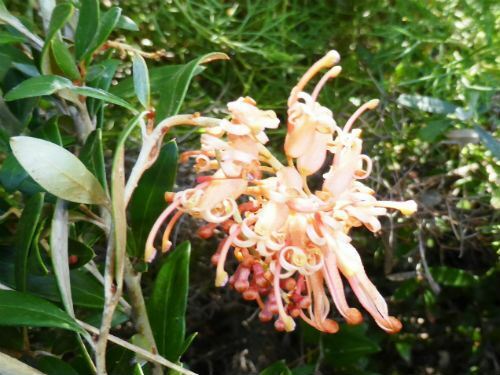 Grevillea “Apricot Charm” is a spreading shrub reaching a height of 1.5 metres with a spread of about 2 metres. The leaves are about three centimetres long, dark green and glossy. The large flowers are held in pendulous clusters, apricot coloured and make their presence felt in winter and spring. The blooms are nectar-rich and attract honeyeaters. “Apricot Charm” is another colourful release from Bywong Nursery in southern NSW. It arose as a chance seedling in their gardens. One of the parents may be G. olivacea. “Apricot Charm” could be trimmed to create a low formal hedge. Light pruning is always appreciated.